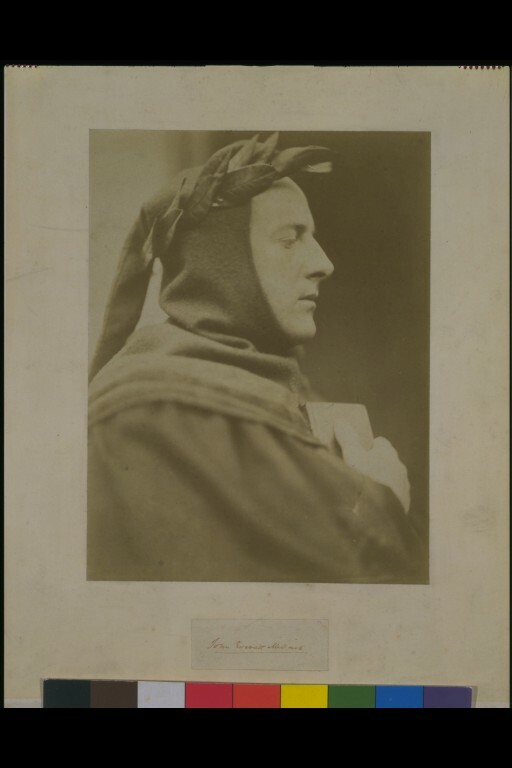 This portrait represents the painter John Everett Millais, who is dressed up as Dante. At this date Millais had become fashionable and had left behind many of his Pre-Raphaelite ideals. It is interesting that he still chose to impersonate the great early Renaissance poet who was so important to the Pre-Raphaelites. David Wynfield was a painter of historical genre scenes as well as a photographer. However, he began registering his photographs for copyright purposes from December 1863, which indicates that they too had commercial and artistic significance for him. He was a founder member of the St John's Wood Clique in the early 1860s. Members shared an interest in historical genre and often held fancy-dress gatherings. A hooded person shown to bust looking to viewer's right. On the head is a wreath. One of 16 photographs [125 to 136 and 197-1945] of Victorian painters and illustrators, most members of the Royal Academy, in fancy dress, ca. 1860s. Provenance: By descent to J E Hodgson, Dr Harold Hodgson. 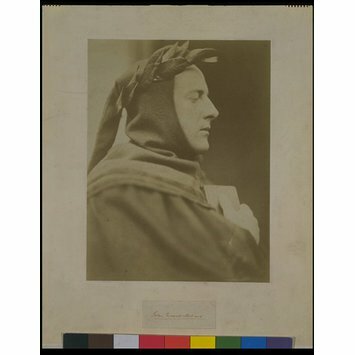 Letter, Hodgson to the V&A, Dec 18 1944: "I have included some photographs of artists - contemporaries of my father, in fancy dress that were taken by David Wynfield, an artist, one of the St John's Wood Clique - unfortunately, at this distance can't put names to them all." Records indicate the original gift comprised of 13 photographs. It is not clear if 126a, 136a and 197 were part of the original gift, although the donor's father is included in the additional group. Note: Wynfield, the great-nephew of the Scottish painter Sir David Wilkie, was a painter of historical genre and a foundling member of the St John's Wood Clique in the early 1860s. Other members of this group included Philip Calderon, William Yeames, John Hodgson and John Philip, who are all represented in this collection of portraits. The Clique members shared an interest in historical genre, and often held fancy dress gatherings. Several of Wynfield's fancy dress portraits of his artist friends are registered in the copyright office, as of December 1863, indicating that he was involved with photography from the earliest days of the Clique's formation. He was the only member of the Clique not elected to the Royal Academy. Stylistically, his work recalls that of Julia Margaret Cameron, with whom he was acquainted. 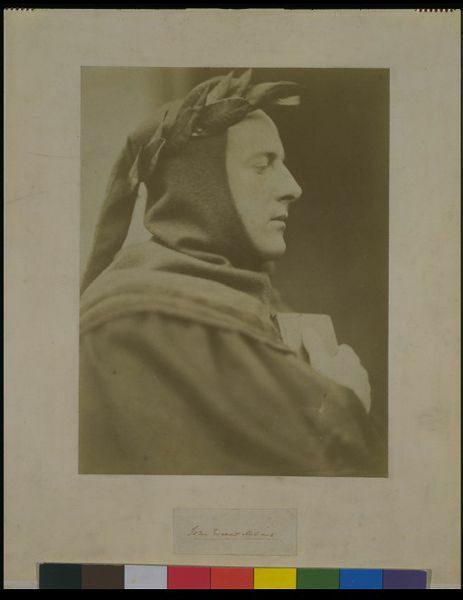 Photographic portrait of John Everett Millais as Dante by David Wilkie Wynfield, England, ca. 1864.